[ Rev. Frederick William Verney, English Secretary, Siamese Legation, London. ] 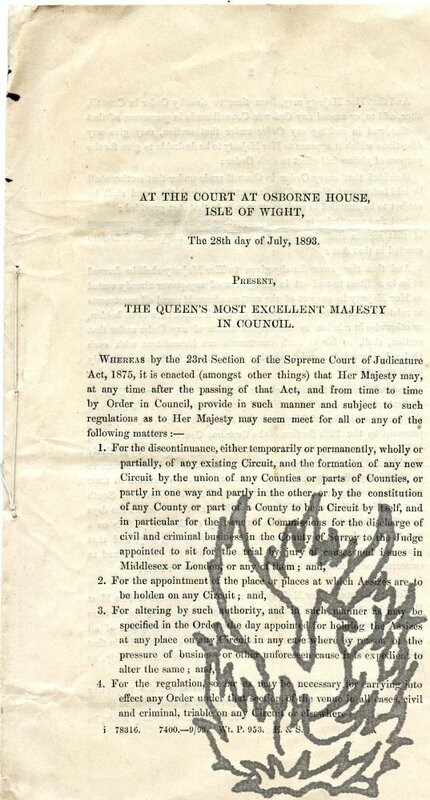 Autograph Letter Signed ('Frederick Verney') to Sir Albert Woods, on the sending of 'the Rules of the Order of Victoria & Albert for transmission to the King of Siam'. 2pp., 12mo. In good condition, lightly-aged, with minor traces of glue along one edge. 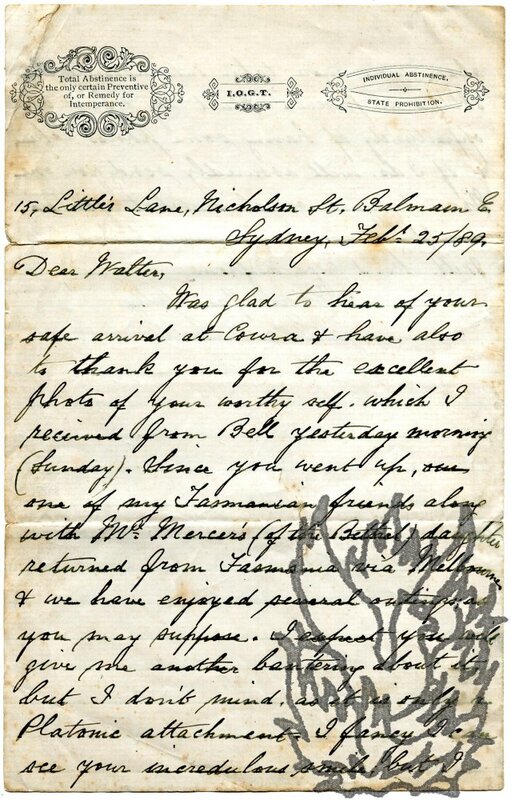 He thanks him for 'so kindly procuring permission to send me the Rules of the Order of Victoria & Albert for transmission to the King of Siam'. He asks 'what Foreign Orders are given to women', and would like to know how to 'get at the rules which give these'. [ Nisbet & Co., Ltd., London publishers. ] Two items: 'Nisbet & Co., Ltd. | Juvenile Order List', August 1917' (with many items by R. M. Ballantyne) and 'Nisbets' Preliminary List | Autumn, 1917'. Nisbet & Co., Ltd., 22, Berners Street, London, W.1. 1917. Both items in good condition, lightly-aged. ONE: 'Nisbet & Co., Ltd. Juvenile Order List'. 4pp., folio. Bifolium. Blue addendum slip tipped-in onto front cover. Divided into 18 sections, including 'The Schoolgirl Series', 'Little Picture Books' and 'The Dominion Library'. With a heavy emphasis on R. M. Ballantyne, with four sections titled: 'R. M. Ballantyne's Famous Stories for Boys | The Copyright Edition', 'R. M. Ballantyne's Tales of Adventure', 'R. M. Ballantyne's Stories | Crown 8vo' and 'R. M. Ballantyne's Stories | Crown 8vo. Picture Cover'. Autograph Letter Signed from the Lancashire antiquary Charles Hardwick, Grand Master of the Manchester Unity Order of Odd-Fellows, to J. T. Baron of Blackburn, regarding his history of 'The Provident Institutions of the Working Classes'. On letterhead of 'The Odd-Fellows' Quarterly Magazine, the Organ of the "I.O.O.F. Manchester Unity Friendly Society'. 7 March 1882. 1p., 12mo. On bifolium. Good, on lightly-aged paper. In original stamped and postmarked envelope, initialed by Hardwick. In the letter Hardwick informs Baron that his 'History' (published in 1851) is out of print: 'The few remainders were sold about four years ago.' He recently saw a copy 'in one of hte Manchester second hand booksellers' catalogues on sale for 17/6'. He gives the names of two booksellers to approach ('Gray, 25, Cathedral Yard, or Sutton, Portland-st. Oxford st.') and is forwarding 'a circular respecting my forthcoming work' (not present). 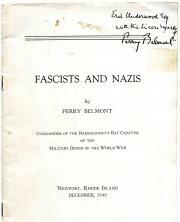 [Printed order of service.] Westminster Abbey. The Funeral Service of the late Thomas Hardy, O.M. Monday, January 16th, 1928. 2 p.m.
Vacher & Sons, Ltd, Westminster House, S.W.1. 9pp., 12mo. Unbound pamphlet of five leaves. Fair, on aged paper, with rust to staple. Gives the two pieces played 'Before the Service', 'The Sentences', 'The Lesson', 'Hymn', 'The Nunc Dimittis' and 'The Blessing'. Scarce: the only copy on COPAC at the British Library, with a further four copies on WorldCat. Fascists and Nazis. 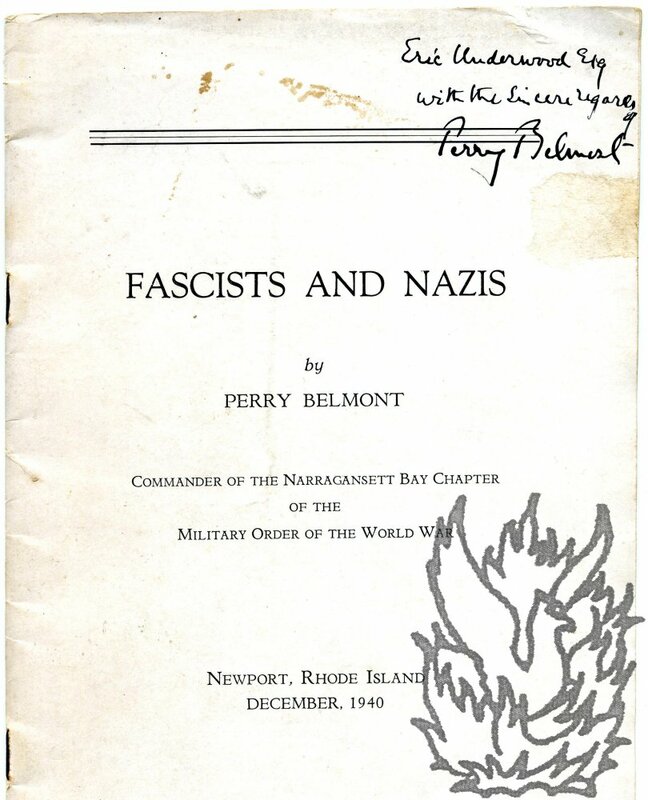 By Perry Belmont, Commander of the Narragansett Bay Chapter of the Military Order of the World War. 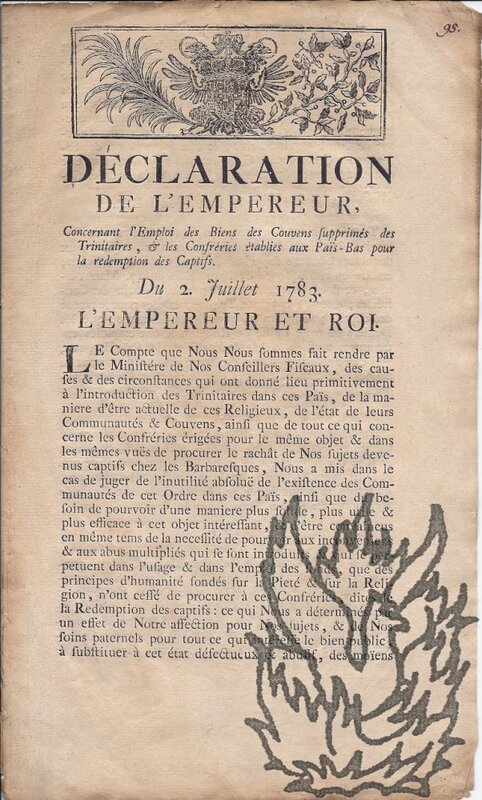 [Privately printed.] Newport, Rhode Island: December, 1940. Stapled pamphlet. 8vo, 27 pp, including full-page photograph of Mussolini embracing a man in Nazi uniform (Himmler?). Fair: internally clean and tight; some marking and wear to covers. Inscribed on title-page to 'Eric Underwood Esq with the sincere regards of Perry Belmont'. (Underwood is perhaps the English-born Australian nutritionist, 1905-1980.) Curious, digressive, energetic attack on fascism, with sections on the Teutonic Order, 'Oath-bound organisations' (Freemasonry) and 'Gangsters'. Autograph Letter Signed ('Geo. T. Gell') to 'Dear Walter'. 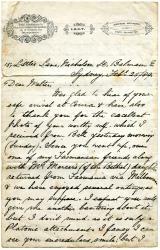 25 February 1889; 15 Little's Lane, Nicholson Street, Balmain, E. Sydney, Australia [on I.O.G.T. letterhead]. 8vo: 4 pp. Bifolium. 66 lines. Text clear and complete, on aged, spotted and worn paper. Letterhead with printed mottos in decorative borders: 'Total Abstinence is the only certain Preventive of, or Remedy for Intemperance.' and 'INDIVIDUAL ABSTINENCE. | STATE PROHIBITION.' In conclusion Gell apologises for 'what you no doubt will stigmatize as an absurd letter', and to the modern reader this item is certainly unintentionally-amusing. Since his correspondent 'went up', 'one of my Tasmanian friends along with Mrs.
Dublin: Hodges & M'Arthur; London: Longman, Rees, Orme, Brown and Green, 1827. 215pp., errata slip present,original plain boards, recently rebacked with new spine label, binding worn, contents foxed (mainly lightly, but a few concentrations) throughout but mainly good. Very scarce. No copy listed on WorldCat or COPAC, but the National Library of Ireland has three copies (one a second edition). Autograph Note Signed to "Mon cher ami". Governor-General of Finland 1866-1881. In French, a large hand, but some hard to read (hence dots). 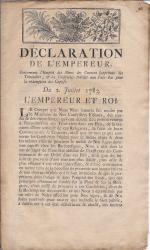 Two pages, fomerly torn in four pieces, crudely sellotaped together, text clear and complete, as follows: "Le porteur de ces ligues, Monsieur Stepanof, dont je vous avais porte il y a et cela quelques mois, merite d'etre employe. Il est parfaitement recommande et [?] de l'experience en affaires. Son frere est membre de Comite [F...?] . . . Je crois vous rendre service . . ."
Order to pay Captain Eliphalet Thorp. On piece of laid paper, dimensions roughly 7 1/2 inches by 6 inches. Browning, creased and discoloured, with some foxing and staining. Reads 'Sir | Pay Capt. Eliphalet Thorp Six hundred pounds - and charge the State . . . Pay Table Office March 6th 1780 | £600'. Signature of 'Saml written over those of two members of the Connecticut Pay Table, Finn Wadsworth and John Chenevard, and with 'John Lawrence Esqr- | Treasurer' in bottom left-hand corner. Docketed on reverse 'Dan Parmule' and 'No 3239 | Order | Capt. Eliphalet Thorp | £600 | March 6th. 1780'.